R. Stern, T. Wang, J. Carrete, N. Mingo, G. Madsen. Multiple phonon scattering rates present in FeSi. For acoustic phonons with long wavelengths 1/τ iso ∝ ω4 for phononisotope scattering and 1/τ Fe ∝ ω4 for phonon-vacancy scattering. 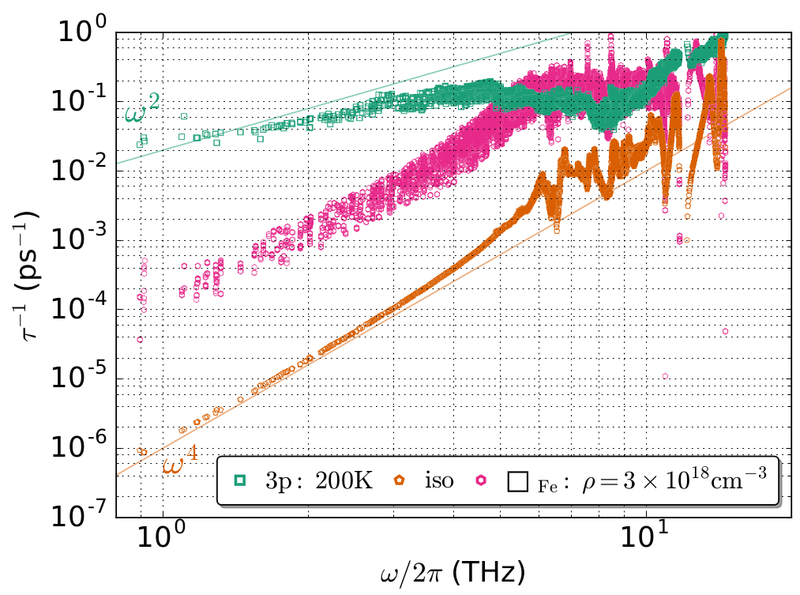 The unique transport properties of B20 FeSi have been investigated for decades. The progress in theoretical calculations allows the explanation and prediction of more and more of such properties. In this paper we investigate the lattice thermal conductivity of FeSi. Calculation for pristine FeSi severely overestimates the lattice thermal conductivity compared to experiment. We point out that the defect concentration can be considerably larger than indicated by the Hall coefficient. The defect formation energies are calculated and it is found that a substantial amount of iron vacancies can form at thermal equilibrium. These will lead to an increased phonon scattering. To explain the thermal conductivity of FeSi, we consider phonon-phonon, isotope, and phonon-defect scattering to assess possible scattering mechanisms. The calculated thermal conductivities indicate that phonon-defect scattering is important in order to explain the reported experimental values.